Tenor Ian Bostridge joins Ludovic Morlot and the Seattle Symphony in an album exploring the music of iconic French composers renowned for their inventive spirit: Berlioz, Ravel and Debussy. 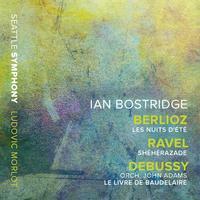 Hailed by The Seattle Times for his “warm tone quality and beautiful expression” during the performance of Berlioz’s Les nuits d’ete, the live-in-concert track is paired with studio recordings of Ravel’s imaginative Sheherazade and Debussy’s colorfully rich Le livre de Baudelaire, orchestrated by John Adams. With naturalistic imaging, depth of field and dynamic range, all Seattle Symphony Media recordings have been engineered to audiophile standards and aim to capture as realistically as possible the sound of the orchestra performing on the Benaroya Hall stage. The present release was mastered by 2017 Grammy Award Winner Dmitriy Lipay.